Dozens of delegates lined up to congratulate Ingmar De Vos on his victory in today’s election for FEI President. FEI Secretary General Ingmar De Vos has today been elected president of the world governing body, winning a solid majority in the first round of voting. De Vos, the Belgium nominee for the position being vacated by Princess Haya after eight years, gathered the two-thirds majority required under the FEI constitution to be elected in the first ballot. The results of the electronic poll showed that 98 federations voted for him. French nominee Pierre Durand received 21 votes, Swiss nominee Pierre Genecand received six votes, and British nominee John McEwen collected six votes. Danish candidate Ulf Helgstrand formally withdrew his nomination before voting. The result was announced by Princess Haya, with the simple words, “I am pleased to announce we have a new FEI President, Ingmar De Vos”. Her words were met with prolonged applause from close to 350 delegates representing 91 National Federations, stakeholders, sponsors and international media. The FEI Bureau is expected to move with some urgency to appoint an interim secretary general to replace De Vos while the recruitment process to find a permanent replacement is undertaken. De Vos told delegates he was overwhelmed by the extent of support revealed by the vote. 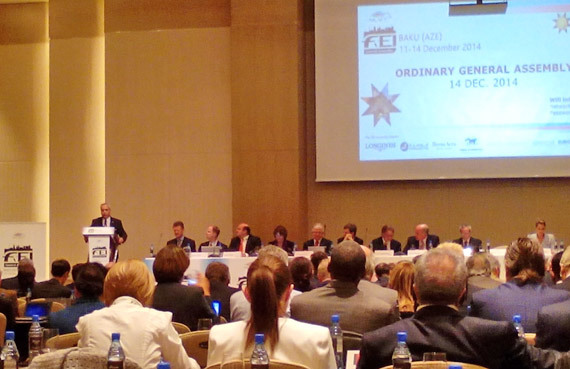 “From the bottom of my heart I thank you for your support and confidence,” he told those gathered for the FEI General Assembly in Baku, Azerbaijan. He thanked his fellow candidates, commenting on the quality of debate generated by the campaign. De Vos pledged to work for unity and assured federations that he would work hard for all of them. De Vos said he had hoped until a couple of months ago that Princess Haya would choose to stay on in the role, but it was not to be. “Words are not enough,” he said. “Words cannot explain what she has done for our organisation. “She has shown leadership; guided us through difficult waters. De Vos, early in the afternoon session, proposed American John Madden as his first vice-president and Sheik Khalid Bin Abdulla Al Khalifa, who is group VII chairman, as second vice-president. He also proposed that Sabrina Zeender, who is currently serving as the FEI’s director of governance and executive affairs, as interim secretary general. De Vos, 51, holds degrees in political science, business administration and international and European law and started his career as an adviser to the Belgian Senate. He joined the Belgian Equestrian Federation as managing director in 1990, and held the additional role of secretary general from 1997 to 2011. He was secretary general of the European Equestrian Federation from 2010, the year the organisation was formed, until 2011. During his time at the Belgian National Federation, De Vos was chef de mission for the Belgian equestrian team at all FEI World Equestrian Games from 1990 to 2010 and at several Olympic Games. De Vos has been FEI secretary general since May 2011. Newly elected FEI President Ingmar de Vos addresses the FEI General Assembly in Baku following his win over three other candidates. Outgoing president, Princess Haya, is at far right of the picture.